Taste test: Taste like a light barbecue chip; a little sweeter than most barbecue chips. Pretty good. Didn't smell or taste like paprika. We were expecting a lot more heat. Smell test: Smells like barbeque chips. Trivia: One ingredient is beetroot powder. 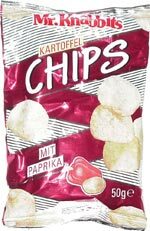 This snack was discovered by Amitai in Germany.